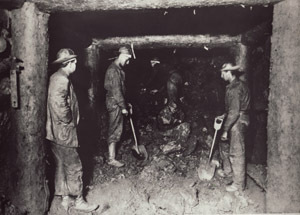 Recorded in Stone is an instructional web site on the history of immigration to the Marquette Iron Range in the central Upper Peninsula of Michigan. 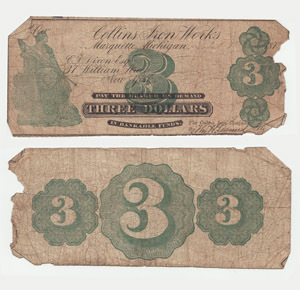 Produced by the Central Upper Peninsula and Northern Michigan University Archives and funded in part with a grant from the Michigan Humanities Council, the web site features digital reproductions of oral histories, original documents, photographs, bibliographies, and lesson plans for high school social studies teachers. The site also includes a set of summary histories of significant immigrant groups written by area scholars. A symposium held on the campus of Northern Michigan University on October 18, 2008. At the symposium, six scholars presented papers on Native American settlement and the immigration of the Finns, Swedes, Yankees, French – Canadians, and Italians to the Marquette Iron Range. The symposium featured presentations by Dr. Arnold Alanen, University of Wisconsin – Madison, on the evolution of immigration during the nineteenth and early twentieth centuries and by Dr. Terry Reynolds, Michigan Technological University, on the nature of immigrant labor activism in the nineteenth century. You can view the entire symposium or individual presentations via Mediasite Live from the project web site. The Marquette Iron Range developed quickly following the discovery of iron ore on September 19, 1844. The famous surveyor, William Austin Burt, accidentally made the discovery near present day Negaunee. His compass had failed due to the magnetic resonance from the many out-croppings of iron ore in the vicinity of Teal Lake. In the following year, Philo Everett formed the Jackson Iron Company and began mining operations in the Jackson Location near Negaunee and opened the Carp River Forge in 1847. 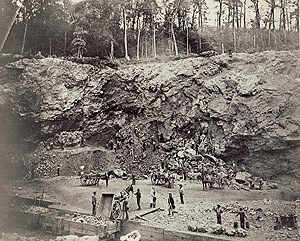 With the opening of the St. Mary’s River shipping canal and locks in 1855, mining on the Marquette Iron Range became economically feasible on a large scale. Many mining companies quickly established themselves on the Range, culminating in the merger in 1892 of the Cleveland Iron Company with the Cliffs Iron Company to form today’s Cleveland-Cliffs Iron Mining Company. The Iron Ore Industry on the Marquette Iron Range centered on the towns of Ishpeming and Negaunee in western Marquette County. Both towns grew-up as a scattering of locations around the major iron mines. The city of Marquette, incorporated in 1859, served as the primary shipping and financial center of the Range. Negaunee was incorporated as a village in 1865 and as a city in 1873. Similarly, Ishpeming was incorporated as a village in 1859 and became a city in 1873 with a population of 4, 692. A plank road initially connected the urban centers of the Range to Marquette but was soon replaced by the Iron Mountain Railroad in 1857. By the turn of the century, both communities were well established and settled towns. In 1910, Negaunee’s population and geographical size had more than doubled since its founding. Moreover, the ratio of men to women in the town was 1.9 and this number drop to 1.3 by 1930. The number of foreign born reached a peak in 1910 of 47.6 and then began a decline to 33 percent by 1930. As the larger of the two towns, Ishpeming developed in much the same way as Negaunee. Population dropped from a high of 13,255 in 1900 to 9,238 in 1930. Between 1900 and 1930, the town lost a third of its population. Astoundingly, the total foreign-born population decreased 53 percent during this period, with the Finnish born population dropping 29.2 percent (1129 to 799) between 1910 and 1920. Geologically, the Upper Peninsula of Michigan is split into two distinct physiographic regions along a roughly vertical line that travels through Marquette. To the east of this line are mostly sedimentary rocks, such as shale, sandstone, and limestone, which form the northern edge of the Michigan Basin. To the west of this line, however, where the Marquette Iron Range is located, the rocks are mainly Precambrian-age (up 2.8 billion years old), igneous and metamorphosed rocks, which form the southern edge of the Canadian Shield. In particular, the geology of the Marquette Iron Range is associated with the Marquette Syncline, a belt of generally east-west trending down-folded rock units, created during a period of continental collision and intense metamorphism. The rock units consist of a complex series of quartzites, slates, meta-dolomites, banded iron formation, and diabase and meta-diabase intrusions. The formation of the iron ore took place about 2.5 billion to 1.8 million years ago as a complicated series of events deposited iron in varying amounts within the folds of the syncline. The Marquette Iron Range is locatedThe Marquette Iron Range is located on a topographic plateau, roughly 600 to 800 feet above the level of Lake Superior, which is about 600 feet above sea level. This plateau includes many hills which rise another 400 feet or so to a level of 1,400 feet above the lake level. In terms of landform types, these hill features are known as roche moutonnées, which are made of hard Precambrian rocks that were resistant to glaciations and weathering. The roche moutonnées of the Marquette Iron Range typically display a repeating topographic pattern that consists of a steep north side, smoothed by direct abrasion from glaciers, and an even steeper and jagged south side that has been “plucked” by glacial activity. Plucking occurs at the base of a glacier when meltwater freezes into cracks in the outcrops, which then results in the tearing out of large pieces of the rock when the glacier surges forward. These plucked and abraded rock outcrops exposed extensive surface exposures of iron ore, which later figured prominently in the discovery of the ore on the range. In general, the soils of the Marquette Iron Range consist of well-leached, Spodosols in most upland settings such as outwash plains, moraines, and former coastal plains. Poorly drained Histosols are often found in tracts of wetlands, and several areas consist of rock outcrop complexes associated with exposures of bedrock units. The Marquette Iron Range is within the drainage basins of the Carp, Middle Branch of the Escanaba, and the Michigamme Rivers and more or less straddles the divide between these catchments. The northern and eastern half of the Range is primarily drained by the Carp River and its tributaries Carp Creek, Morgan Creek, and various other smaller streams, which collectively flow from the west of Ishpeming generally to the east, eventually draining into Lake Superior on the south side of Marquette. The headwaters of the Middle Branch of the Escanaba River, along with its many tributaries, drain the south-central portion of the Range, sending water generally south into the main branch of the Escanaba River. The climate of the Marquette Iron Range is considered Humid Continental with short, cool summers and long, cold winters (Dfb) in the Koppen Climate Classification System. Average high temperatures during the summer moinths are in the mid-70s while average winter lows are in the teens. Temperatures are, however, moderated somewhat by the presence of Lake Superior, such that summer and winter extremes are slightly less in Marquette as compared to farther inland. Average annual precipitation is roughly 40 inches. Average annual snowfall amounts range from 150 to 300 inches depending on elevation within the range. Joe R. Whitaker, Negaunee, Michigan: An Urban Center Dominated by Iron Mining, Unpublished dissertation, University of Chicago, Chicago, Ill, 1931, p. 28. Robert Goodman, Ishpeming, Michigan: A Functional Study of a Mining Community, Unpublished Dissertation, Northwestern University, Evanston, Ill, 1948, p. 22-25.